West Midlands Police said officers are treating the vandalism to the retaining wall surrounding the 'Lions of the Great War' sculpture as "racially-aggravated criminal damage". The 10-foot high statue, which depicts a Sikh soldier, was unveiled last Sunday. 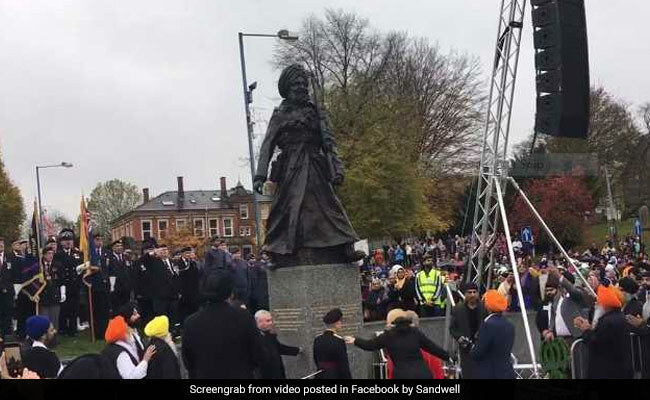 A UK police force on Saturday launched a hunt for vandals who attacked a newly-inaugurated Indian war memorial in the town of Smethwick in the West Midlands region of England. The 10-foot high statue, which depicts a Sikh soldier symbolic of the contribution of South Asian soldiers to World War I, was unveiled last Sunday at a spot between the town's High Street and Tollhouse Way and is believed to have been targeted with graffiti in the early hours of Friday. "We understand that this attack has caused a lot of concern in the community, and we are working to understand the reasons behind it and identify whoever is responsible," said Sergeant Bill Gill from the Smethwick Neighbourhood Team of West Midlands Police. "Officers had already planned to be at the remembrance event which is happening tomorrow (November 11) at the statue. I'd urge anyone with concerns to speak to the officers attending the event," he said. He added that CCTV footage is being recovered and officers are working closely with worshippers and management at the Guru Nanak Gurdwara Smethwick, which had commissioned the statue to honour the sacrifices made by South Asian service personnel of all faiths. The words "Sepoys no more" were daubed on the base of the sculpture. A thick black line was drawn through the words "Great War". "There was some damage to the back wall which is disappointing. The graffiti was cleaned off and the matter reported to the police," Jatinder Singh, President of the Guru Nanak Gurdwara Smethwick, said in a statement. The bronze statue was unveiled last week to commemorate the 100th anniversary of the end of World War I in November 1918, also referred to as the 'Great War'.